Valentine's Day cards that you can customize and these holiday gifts are always a hit when someone is trying to impress that special person in their life. 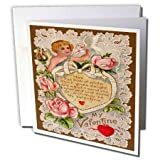 Valentine's Day images on greeting cards include teddy bears, hearts, fancy hearts, chocolate, flowers, Victorian ladies, cupid, roses and so much more and are available on a range of products besides the cards for that special person. Even the anti-love items for the broken hearted. The cards shown on Amazon from Sandy Mertens designs of 3DRose can be personalized directly from their site. Zazzle is a total customization shopping site when one can exchange the photo for their own. Or enlarge, tile and move it around to give the look that they would want. Add your own text to these cards on Zazzle. This is something that you can do with an online print on demand shop. Something that you cannot do when buying them from a local store. 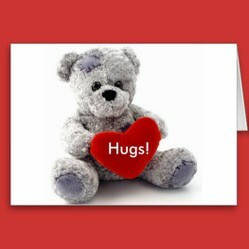 I just love Valentine's Day greeting card with this image of a stuff toy bear with a patch on its head. It shows that it may have seen better days. The patchwork shows the love that this little bear is loved by someone special. He is holding a heart with the word "Love!" in the middle of it. This word can be changed to anything you would like it to be. "Hug" "Kiss!" "Sweetie!" "Sheri!" Add your own verse on the inside of the card. This design is ideal for sweethearts of all ages from children to adults. The 1800's were a very popular time in Europe with the paper Valentines. Many of these were homemade. Today's technology has allowed a person to shop for that perfect gift and card online. Electronically a person can personalize their own message and photo before buying it and sending it out. Below is a collection of my Valentine's Day greeting cards and and can be found on postcards on Zazzle. Both modern and vintage images on these cards from Sandyspider Gifts: Valentines on Zazzle and Sandy Mertens Valentine's Cards on Amazon. The cards on Amazon are from 3DRose where you can find all of Sandy Mertens designs 3/4's down each of the product pages. Cupid is usually pictured as a chubby naked child. Often times with wings because cupids can fly. Personally I have yet to see one of these non-humans flying around with bows and arrows. Watering flowers or handing out a bouquet of flowers. However I do love the images on cards. These vintage designs go back to the early 1900's. It seems sweet to see a darling cherub or cupid with a bouquet of red or pink roses. A kiss of affection from the boy is cute. 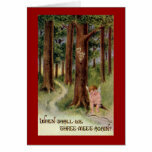 Then there is sadness in the card titled "When Shall We Meet". This could represent a long distance relationship or a new relationship. Perhaps a long lost love and trying to rekindle the past. Give me the modern look any day. Cannot decide. Love them both. Which do you prefer the vintage look or a modern look with images on card? Something special about the Victorian times with the women dressed up in their full skirted dresses and large flower bonnets. Love the Victorian lady in a heart cameo. So much detail to this card. Red hearts and blue flowers are roped together in border around the cameo. A cupid is reading a book. Could it possibly be the book about love or a love spell? The second card is a cute vintage card of a little boy and girl sharing a kiss, with the bonnet so large that one cannot see their faces. Next to that is a modern card of a young couple sitting on the couch. On the inside it says, "I like you!" Course this quote can be changed to anything. Below is a favorite of mine for it is in my personal collection of a real postcard that I own. With the date of 1908 stamped on the back of the card and was scanned in for products on Zazzle as in the Valentines greeting card shown here. Inside the Victorian Valentines Couple with Verse Card is a verse from the poem titled Bread and Music. They knew you once, O beautiful and wise." 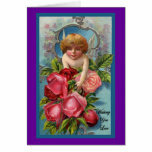 Vintage My Valentine Cupid Greeting Card poem on the heart on the cover of the card. "May This bow of white Which gives delight, And which I send you A token be of Love divine Oh, with thou be My Valentine." Unique and funny Valentine cards are available when searching on Zazzle under Sandyspider Gifts, Funnyjokes Gifts, Youphotoit Gifts, AtoZunMe Gifts and Kingdomofanimals Gifts. 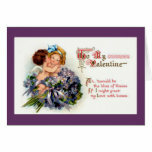 Many card designs are on Sandy Mertens Valentine Designs and Sandy Mertens Vintage Valentine Designs on 3DRose. Read more about these cards on Special Love and Anti-Love Valentines Cards. DerdriuMarriner I think there are merits in both too. sheilamarie, I know I am slow at responding. But thank you. Your vintage cards are a great find! sandyspider, The anti-Valentine about slicing a heart in two is super! I wish I could vote a second time on this article since the information and the products work any day, not just on Feb. 14, that one's appreciating friendship and love or crying in one's beer (coffee, gin, juice, tea, vodka, water, whisky, wine). Sheila Marie, I do have to agree with you on that.with the best quality since I have bought many Zazzle cards. Zazzle cards are the best as far as quality and customizing goes. I love your vintage designs, Sandy. sandyspider, Valentine's Day is just around the corner! It's so close to the New Year that I like both the modern and vintage, kind of like moving from the old year to the new. Flower magnets, Zazzle, sandyspider gifts, summer flowers, photos of flowers, roses, violets, Columbine flower, zucchini flower and great gift ideas for the kitchen. Watches, necklaces, earrings, bracelets and other stunning jewelry are found online for mother.